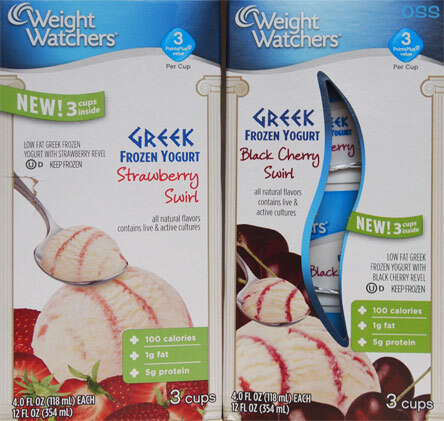 [2014-2015] Weight watchers has a few new 3 PointsPlus frozen treat cups for us this year including 2 greek frozen yogurts. Now greek yogurt really isn't my thing, but hey, if Wells wants me to try them for free, who am I to say no? Which is which? hehehehe. I think there is a little bit of a fruity smell. There's nothing about letting these temper, so let's dig in to the.... ahh, strawberry first. Hmmm, it's surprisingly not tart, yay! It's quite sweet actually with like a hint of cream cheese to it. Cool. It's also very soft, a really easy scooper. This is only a 100 calorie cup so I'm trying to go slow (yet still 5 grams of protein). Wow, with the strawberry so mild, I wasn't really expecting the cherry tang here. Not crazy strong, but undeniable. Doh, the tang only comes from the swirl (I know, stating the obvious), so we've got the same mild base going on. Yes, I think there is just a tad of that greek froyo chalkiness that I detected with the Healthy Choice version, but it's nothing to worry about. Both of these are melting pretty quickly. 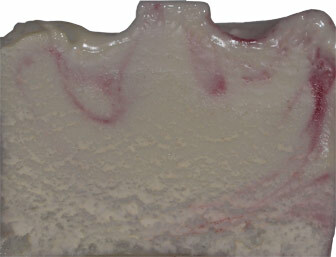 Unlike a super premium ice cream, the melted part won't hold the cold like you might be use to. Not a complaint, just an observation as I polish these two off. Yeah, both are fine, but I like the strawberry more. Where the cherry added a little bit of bite, the strawberry accentuates the sweetness (I swear I taste cream cheese on the strawberry one). Alright, fine job on these, go ahead and try these if they catch your eye. How does this compare to Healthy Choice in your opinion Nick? The strawberry looks good but since I didn't like the Healthy Choice I am hesitant. 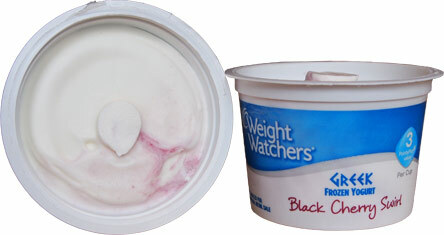 very similar products, less chalky texture, little less fruit flavor. I didn't mind these at all. I loved the strawberry & they had the chocolate icecream cups ww!!!! Now none of my local stores or anywhere i have traveled sell these why why????? I loved the convenience of being able to take to a party to stay on my healthy eating style please return these!!!!!! Sorry, but the greek froyo scene is imploding quickly. These must have been caught up in that.